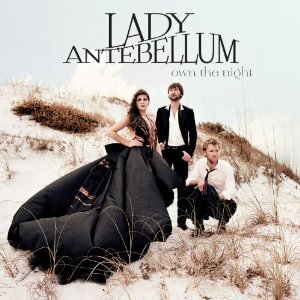 Own the Night is the 3rd studio album of the country group Lady Antebellum. The trio, which consists of Charles Kelley (lead and background vocals), Dave Haywood (background vocals/piano/guitar), and Hillary Scott (lead and background vocals), was formed in 2006 in Nashville, Tennessee and debuted in 2007. They have won CMA awards, Grammy awards, and have gotten the honor to sing at a World Series game and on American Idol. I do have to admit that country music is one of my least favorite musical genres, but I wanted to try something new. I have a couple of Keith Urban’s albums, a Reba McEntire album, and The Wreckers’ album. I’m very specific about what I will listen to that is classified as country, and I was pleasantly surprised by how much I enjoyed Lady Antebellum. Own the Night features 12 tracks, all of which are about love, reminiscing, new relationships, and moving on from a broken relationship. Of the 12 songs, two really stood out to me: “When You Were Mine” and “Love I’ve Found In You”. “When You Were Mine” has a beautiful instrumental intro featuring piano, and Hillary Scott’s beautiful voice singing about a man who broke her heart, even though he had promised he never would. This is a song I could listen to over and over, and if it had been around when I was in my teens or early 20’s, it would have been my theme song. “Love I’ve Found In You” is really upbeat, and is a positive message about a relationship that is heading in the right direction. I loved the beat and couldn’t stop myself from tapping my feet and singing along. Lady Antebellum’s lyrics are clean, nothing too explicit, so I would feel comfortable letting children listen to their songs and sing along. Even though one song is about a one night stand, it still focuses on the positive outcomes of the union and what was learned from it, and the deeper meaning of it will be lost for the time being on younger ears. I will definitely be exploring more of Lady Antebellum’s music because I liked this album so much! 1 lucky Simply Stacie reader will win a copy of Own the Night, as well as a signed cover album.